Sinsheim - 1899 Hoffenheim get their 2013/14 Bundesliga campaign underway at home to 1. FC Nuremberg on Saturday, 10 August. A simple statement of fact, but it's a scenario the vast majority of followers of the German game, not least the club's supporters themselves, would have considered highly improbable when Markus Gisdol took up the reins as head coach at the start of April. At that point, the former village club from the south-western Kraichgau region were second-bottom of the table, four points shy of the relegation play-off slot and looking fairly demoralised all-round, with just seven regular-season matches remaining. Gisdol reckoned they still had a "realistic chance of survival" nonetheless and so it transpired, albeit by way of a nail-biting finale. It was a surprisingly upbeat ending to a surprisingly turbulent campaign - one the club had gone into under Markus Babbel nominally gunning for a place in Europe. No such claims are being made this time around, indeed Gisdol - a former assistant to the man who masterminded 1899's rise from the Regional League to the Bundesliga, Ralf Rangnick - was brought back on board tasked with "rebuilding a side for the remainder of the season and beyond", regardless of whether or not they survived the drop. Survive they did, however, and Gisdol will thus be pursuing that unaltered mandate this coming season in the top flight, a notoriously unforgiving testing ground. Intimately familiar as he is with the club's structures and long-term aspirations, the former midfielder whose own playing career was cut short by injury at 27 has wasted no time making plain that the club's new direction is in fact its old one. The promotion of talent from within is once more being prioritised, along with a brand of football which, as last season's skipper Andreas Beck put it, "rings a very loud bell with me." High pressing and rapier-like counter-attacking, even by the turbo-charged standards of the contemporary Bundesliga, will be the cornerstones of Hoffenheim's game under the new head coach. Beck acknowledges the style is "very intensive, as well as risky, and it'll take time to get used to." Gisdol, who announced on taking over that there would be "no stone left unturned" in the summer restructuring process, has been accordingly busy reshaping the squad to meet those requirements. Most of the movement thus far has been in an outward direction, with further big-name signings from the none-too-distant past, such as goalkeeper Tim Wiese, Swiss frontman Eren Derdiyok, experienced defender Matthieu Delpierre and Dutch international Edson Braafheid also apparently out of the frame as far as Gisdol's current planning goes. Alongside the remaining stalwarts from last season, the most notable new faces brought on board to date are Germany U-21 central defensive prospect Kevin Akpoguma, signed from Karlsruher SC and forward duo Anthony Modeste, late of Bordeaux, and Norway international Tarik Elyounoussi (Rosenborg Trondheim). Together with the new arrivals, homegrown prospects such as Niklas Süle will be given every opportunity to play their part and gain valuable experience, while the coach is looking to his more experienced players to lead by example. Beck, as yet unsure whether he will still be captain when the season gets underway, cited Sejad Salihovic, David Abraham, Jannik Vestergaard and Kevin Volland among those "who'll have to put their necks on the line." Roberto Firmino undoubtedly falls into that category as well. The 21-year-old Brazilian playmaker came on strong when it mattered most last season and is determined to build on that form and "make the real breakthrough." 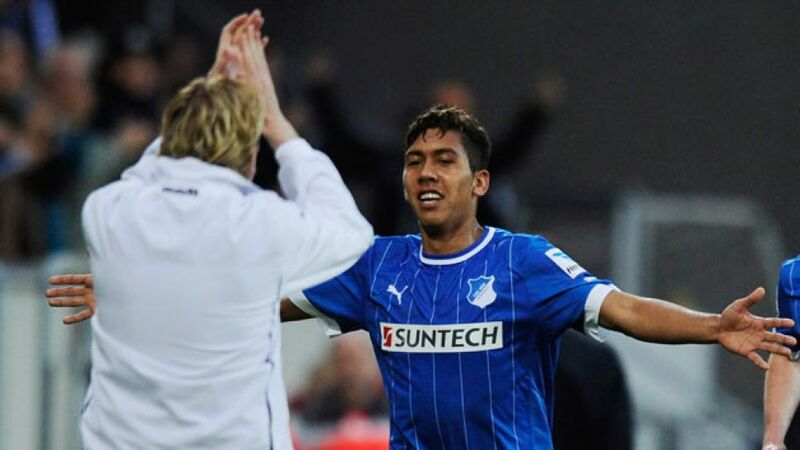 With his future secured at 1899 for the next year at least, Firmino was swift to claim the No10 shirt freed up by Igor de Camargo's departure for Standard Liege. "It's an important number," he explained to sports weekly Kicker recently; "I want to show that I'm ready to take on the responsibility." That will be music to Markus Gisdol's ears - and all the more so if his young troops continue to demonstrate that actions speak louder than words.